Teens talk with Design staff. Screenshot of the teens’ final project video. I had the pleasure of being the Media Intern for the 4-week-long High School Internship Program at the Milwaukee Art Museum. As an Interactive Media Design and History major at Alverno College, being chosen to intern at such a beautiful place full of creativity, history, and passionate people was not only a great learning experience, but also a real treat for me. The teens wrote the script and chose the shots. The first couple of weeks I recorded the teens as they went on their learning adventures around the museum, making sure to keep the rule of thirds in mind and copyrighted material out of the frame. In addition, to I also helped out in other ways as much as I could, by taking attendance, carrying tools, leading the teens to where we were going, and whatever else Chelsea asked me to do. 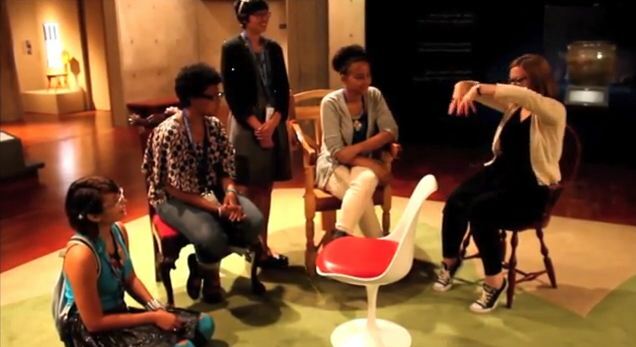 Teens talk with curator Mel Buchanan. Teens talk with Design staff. Screenshot of the teens’ final project video. The second half of the program, I worked on the video with a small group of the teens as they perfected the script and planned what shots they wanted to go with each point in the voiceover of the video. It was great to collaborate with a group other than my fellow Alverno students, and it was a different and interesting experience: being both in a teacher-like position and a contributor. I took their vision, some voiceovers, and an hour’s worth of footage and made it all into a 6 minute long video to contribute to the TED-Ed pilot project. The video came with challenges: Because it would be on YouTube where thousands of people could see it, I had to make sure that we set a good example for artwork rights and reproduction rules. This was an interesting step out of the world I know—using whatever images or shots I wanted for education purposes as long as I gave credit—to being more conscious of copyrights. I learned a wide variety of things about the museum and about myself from this internship, some expected, some unexpected. I learned with the teens as we went behind the scenes, listening and asking questions of the people who make the museum as great as it is. One of my favorite behind-the-scenes facts that we learned was that the exhibition designer and the curators use a model of the exhibition space and tiny versions of the art pieces to decide how the space will look. I enjoyed learning about the different departments of the museum and the number of people it takes to run a museum as large and successful as this one. It made me appreciate the Museum and other museums so much more. I think the biggest lesson that I learned is to find what you are passionate about and find a way to get paid for it. Almost everyone that gave advice to the teens mentioned their passion for art and the Museum and how wonderful that made their job and life. 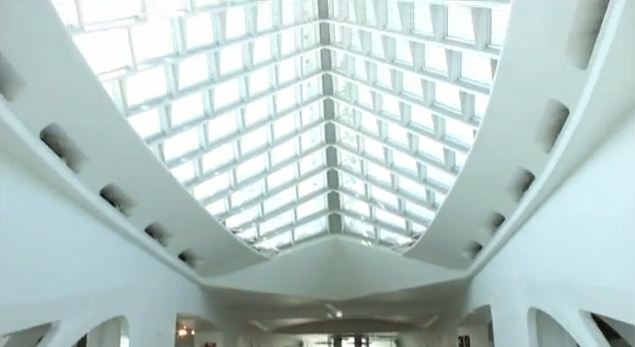 View of Windhover Hall. Screenshot of the teens’ final project video. I hope to work in a museum or anywhere history is shared, so interning at the Milwaukee Art Museum was a great experience that will surely contribute to my future. I have seen the variety of opportunities available in a museum, and I am confident that my Interactive Media Design and History skills will help me find a position in a museum much like the Milwaukee Art Museum. This experience also brought me the closest I have ever been to teaching, which allowed me to explore how teaching fits in with what I would like to do in my career. I want to connect my Interactive Media Design skills with history to make it just as fun, exciting, and relatable for others as it is for me. History is my passion, and, as I learned this summer, if I keep history in my life, I know my passion for it will make my life enjoyable throughout my career. Natalie Boos was the summer 2013 Media Intern for Digital Learning and Teen Programs at the Milwaukee Art Museum. This entry was posted in Behind the Scenes, Education and tagged college, college interns, digital learning, Interns, museums, Teen Programs, youtube. Bookmark the permalink.